"Spider-Pig, Spider-Pig! Does whatever a Spider-Pig does!" You've never seen a collectible like this before! "Spider-Pig, Spider-Pig! Does whatever a Spider-Pig does!" 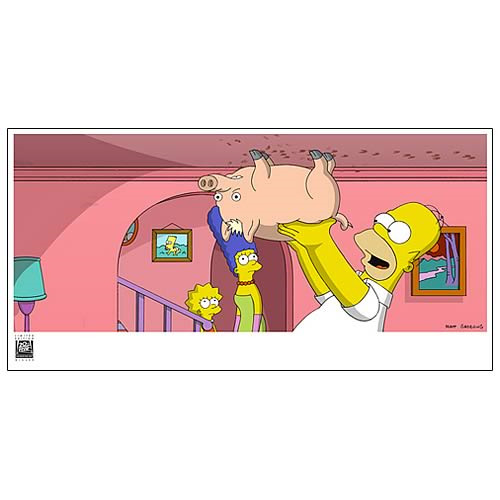 This bizarre moment from The Simpsons Movie features Homer with his portable porker singing the "Spider-Pig" song. Limited to only 195 pieces, this hilariously unique, fine-art giclée is printed on 13-inch tall x 19-inch wide archival paper, with the actual image measuring 7 1/2-inches tall x 17 1/2-inches wide. Bet you've never seen another collectible giclée like this one! It comes unframed, spread on a backerboard with a clear protective sleeve, and includes a certificate of authenticity.